The Intergovernmental Panel on Climate Change (IPCC) established the scientific foundation of a global consensus that human made climate change poses a very severe threat to development and inclusive growth in the medium and long term. The G20 countries are responsible for roughly 80 percent of global energy use and CO2 emissions, and are thus heavyweight players in climate policy. There are, however, concerns about the distributional effects of some climate policies in combating climate change, and their potentially adverse impact on development prospects and economic growth. These concerns can be resolved through an integrated policy package incorporating the scaling-up of low-carbon and climate-resilient infrastructure, sustainable finance and carbon pricing. Despite the collective ambitions that yielded the landmark Paris Agreement, and despite the enhanced commitments to climate action by individual countries embodied in their Nationally Determined Contributions (NDCs), the world is still far from achieving a collective plan to keep the global temperature increase to well below 2°C. The world is also at risk of being caught in a cycle of low and uneven growth, and, with it, of failing to reach the Sustainable Development Goals (SDGs) to eliminate poverty and provide a better life for all. Unlocking the impediments to the scaling-up of sustainable infrastructure can help to meet all three challenges by laying the foundations for strong and inclusive growth; by providing access to energy, mobility, education and health; and by accelerating the decarbonization of our economies. This policy brief proposes a comprehensive approach that links inclusive growth, sustainable development and the climate goals. It builds on a sustainable infrastructure with three key pillars: (i) strengthening and reorientation of investment strategies to exploit the significant opportunities of low-carbon, climate-resilient infrastructure; (ii) transforming finance to enable and drive change; and (iii) phasing out fossil fuel subsidies and putting a price on carbon to harness the transformative power of the market and stimulate low carbon investment. Figure 1: 2014-2030 Cumulative global infrastructure investments required by sector and country income groups. Source: Bhattacharya et al., 2016. Because of a shrinking global carbon budget, increasing climate risks, and long lived infrastructure assets, the window for making the right choices is narrow. To keep temperature increase to less than 2°C with a ‘likely’ chance, the emission of carbon into the atmosphere needs to be limited to roughly 800 GtCO2. 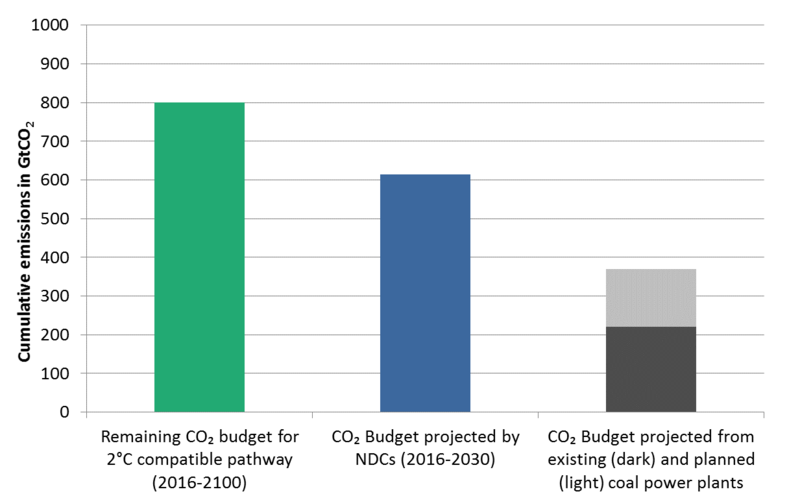 However, the pledged NDCs would consume 75 percent of the total carbon budget by 2030 (see Figure 2). Delay will also increase the cost of future remedial measures and raise the likelihood of catastrophic risks. This underlines the urgency of the problem and the need for stronger action. Building better, smarter and more sustainable infrastructure will allow countries to leverage innovation and continuously strengthen their NDCs in the next decade as required by the Paris Agreement. In addition, making low-carbon and climate-resilient infrastructure investments today will ensure that decarbonization of the global economy by 2050 remains possible; it avoids locking in high carbon investments and gives policy makers leeway to agree to ambitious targets in the future. In addition, sustainable infrastructure investments can help countries to better prepare for future climate impacts. G20 countries should include targets on quantity and quality of sustainable infrastructure consistent with the Sustainable Development Goals and a 2°C compatible pathway within their NDCs, and should recognize infrastructure and investment needs in their long-term climate strategies. To support these targets, G20 countries should undertake systematic assessments of current investments and future plans and of the impediments to sustainable infrastructure. Based on these assessments the G20 should set out concrete proposals for national and collective actions to scale up investments and accelerate the shift to low-carbon, climate-resilient infrastructure. The G20 should invite the Multilateral Development Banks (MDBs) working in cooperation with other international organizations (OECD, IMF, IRENA, IEA and the IEF, and the G20 Infrastructure Hub) and private entities to establish common definitions and standards for sustainable infrastructure that can be used to shape both public and private investments in infrastructure to deliver on a 2°C compatible pathway and the SDGs. The scale of investment requirements for sustainable infrastructure calls for a strengthening of finance from all sources and a reorientation towards green and clean infrastructure, because access to long-term and affordable finance is a major barrier to the scaling-up of investments in sustainable infrastructure. Given growing limitations on fiscal space in many countries, stronger efforts are warranted on public resource mobilization including, as discussed below, the phasing out of fossil fuel subsidies and adoption of carbon pricing. It will also be necessary to strengthen fiscal capacities at a local level since a large proportion of infrastructure spending will be on urban areas. This will require local governments to access their own sources of revenue and for intergovernmental fiscal relations to give a greater role to cities and local governments. In order to unlock the capital needed for sustainable infrastructure, policies that leverage the strengths of both the public and private sectors are needed, with the bulk of the financing being generated by the private sector. There are large pools of domestic and global savings that are not currently tapped for green investments. This includes infrastructure. Macroeconomic risks and weaknesses in governance are an impediment to private sector involvement; transforming finance to enable and drive change will require more engagement from the public sector. The most important impediment to unlocking private sector pools of capital for infrastructure is uncertainty over the reliability of revenues for a given project. Three funding sources can be employed to make sustainable infrastructure projects viable and thereby mobilize private sector green finance: (i) user fees levied on citizens, (ii) availability payments from governments, financed by general or earmarked tax revenues, and (iii) land-value capture levied on project developers. How these funding sources are combined must reflect (i) the ability of users to pay in the short term, (ii) the projected useful life of the infrastructure, and (iii) the timing of spill-over benefits generated by the project. Greater clarity and certainty on how these funding sources will be combined is essential to mobilizing private finance on a large scale. In addition to contributing to revenue streams to make projects viable, governments themselves may address certain risks. First, governments can reduce regulatory risks through legislative frameworks for carbon pricing, as detailed below, and other regulations to support the achievement of the NDCs. Second, MDBs and public infrastructure banks can provide guarantees for loan tenure risk as well as project-related performance risk for innovative infrastructure solutions. Finally, governments may establish public-private partnerships (PPP) if they prove to provide value for money through strong side-by-side tests to guard against uneconomical PPP arrangements. MDBs and national development banks have a special role in supporting infrastructure in emerging markets and developing countries, from the policies and institutions that can translate promising ideas into real demand, all the way through to finance at a manageable cost of capital and the effective management of risk. The MDBs and national development banks are absolutely vital in the early stages of these projects to get over the policy and institutional issues and the most difficult of the risks. If these stages are well-managed, large private sector funds can come in. As part of creating markets to finance sustainable infrastructure and scaled-up deployment of innovation, harmonization of the disclosure of climate-related financial risk throughout the financial system will stimulate a shift of global capital and anchor climate resilience in the global financial system (see T20 policy brief on SMEs and innovation). Information asymmetries related to climate risk make it difficult for investors to assess the physical, regulatory and legal risks of climate change. Today, reporting is voluntary and varies across industries and countries. Mandatory climate-related financial disclosure will guard against the risks of tipping points and contribute to financial stability (see T20 policy brief on Green Finance). These must address three levels of climate-related financial disclosure: (i) how investments contribute to climate change, including the emissions from investment portfolios and low carbon investments, (ii) how climate change will affect the resilience of investments including transition risks and physical risks and (iii) what climate scenario and emissions assumptions are used to assess the climate resilience of investments. For example, only 5 percent of the world’s largest 500 institutional investors have policies in place to actively monitor the risk of stranded assets with their investment managers. Finally, sustainable finance must also be congruent with climate finance as committed under the Paris Agreement. Official development assistance and climate finance remain critical especially for low income and vulnerable countries and can be used to catalyze investments in sustainable infrastructure even in middle income countries. It is important therefore that rich countries live up to their commitments including those made under the Paris Agreement. Generally accepted standards and definitions of “Green Finance” are crucial to attract investors in sustainable infrastructure. Standardization contributes to building comparable capital markets for investment in sustainable infrastructure across borders and to prevent “green washing” (see T20 policy brief on Green Finance). In addition, climate-related financial transparency is needed in all parts of the financial system including banks, capital markets, institutional investors, private equity managers, insurers, public finance institutions and regulation. Today, even for the institutional investors with the most advanced disclosure policies, only 3.4 percent of their assets represent low carbon investments. This needs to rise significantly if sustainable infrastructure investments are to be scaled-up. Policies implemented to assure financial system stability must also be considered in light of climate risks to the financial system. Financial market regulation may impede green finance through investment limits, capital adequacy, reserve requirements, the valuation of assets and liabilities and limits on foreign investment. These can discourage longer-term investment and cross-border investments in sustainable infrastructure as well as in emerging innovations. The effect of these regulations can be tempered by allowing preferential capital and equity for sustainable investments. Moreover, platforms encouraging the collaboration between the private sector, regulators, central banks and academics to establish consistent frameworks and definitions across sectors and countries would facilitate the move from voluntary to mandatory disclosure. The information asymmetries that exist for climate-related financial risk also interfere with projects based on innovative solutions to climate change. These may occur in many areas including, for example, transportation, energy efficiency, renewable energy storage, and methane abatement. In order to accelerate the climate and economic spill-over benefits of public investment in innovation, sustainable finance policies must also address the broadening and deepening of markets for investment in low carbon innovation. This can be achieved by disclosure of the positive impact that investments in these projects have on climate-related financial risk (see also T20 policy brief on SMEs and innovation). Building on the commitments made at the Hangzhou Summit, the G20 should ask MDBs to set a system-wide target for supporting the scaling up of sustainable infrastructure consistent with the ambitions of the SDGs and the Paris Agreement. In turn, G20 shareholders should commit to provide MDBs with the resources and flexibility needed to raise their collective ambitions. The G20 should invite the Financial Stability Board (FSB) to establish a platform to exchange experiences and develop approaches to disclosure on climate-related financial risks (transition, physical and litigation). This platform should be chaired by finance ministries / central banks and involve all relevant stakeholders, including regulators, academia, finance, industry and relevant international institutions. The proposed platform should develop mandatory climate-related financial risk disclosure as well as its corollary, the potential for risk reduction from investment in sustainable infrastructure and in climate-related innovation projects. In addition, the platform should develop model legislation for financial disclosure and the standardization of green finance practices, for both private-sector and state-owned companies consistent with the Paris Agreement and Sustainable Development Goals. Fostering the link between Green Finance and carbon pricing: Development Banks and private-sector financial institutions should be encouraged to adopt shadow carbon pricing in internal decision-making as an instrument to help reduce climate-related risk in their investment portfolio. Implicit and explicit carbon pricing should be introduced as an indicator to improve the transparency of green indicators and make “Green Finance” more traceable (see T20 policy brief on Green Finance). G20 governments should also use their leverage to institute shadow carbon pricing throughout MDBs and (semi-)public national banks. The current price system for carbon favours investment in high-carbon infrastructure for two reasons: (i) fossil fuel subsidies create a perverse incentive for carbon-intensive investments and (ii) there is no price on polluting the atmosphere to steer investments in the right direction. At the global level, every ton of CO2 is subsidized by an average US$ 150 (including negative externalities such as health effects by air pollution) as a consequence of preferential fiscal treatment of carbon industries. By contrast, only 13 percent of global emissions are subject to carbon pricing and the price levels are often low. This incentive structure favours investments in high-carbon infrastructure and disincentivizes low carbon investments. The renaissance of coal, particularly driven by poor but fast growing countries, is one consequence of this perverse incentive structure,. A transition towards low-carbon, climate resilient infrastructure requires both the phasing out of inefficient fiscal policies on the one hand and implementing carbon pricing on the other. As a first step, countries can implement carbon pricing schemes at a domestic level, with rising national carbon price plans, depending on whether they are a developed or an emerging economy. They can then converge on a carbon price in the long-term (see Figure 3). Administrative and political barriers to carbon pricing can be turned into opportunities. Carbon pricing is often perceived to lead to regressive distributional effects and hence to place a greater burden on the poor. While such effects are highly country specific, and in some cases carbon pricing might actually be progressive, potential negative effects for the poor can be addressed through complementary policies (see T20 policy brief on distributional effects of climate policies). For example, Indonesia succeeded in compensating poor households while reforming its fossil fuel subsidy schemes. Complementing fossil fuel subsidy phase out and carbon pricing with support for wider public goods such as health, education, clean energy, and public transport has also proven to increase public support. 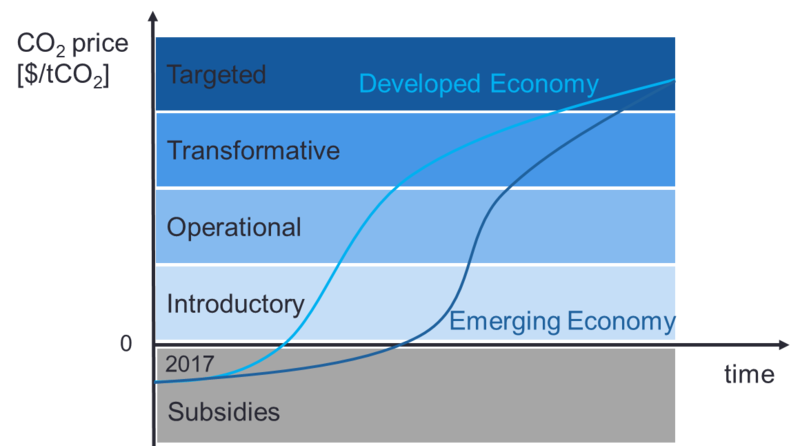 Figure 3: Targeted carbon price for a 2°C compatible pathway for Emerging and Developed Economies. Qualitative representation. Source: based on CDP , own representation. In addition to providing the right incentives for climate change mitigation, getting carbon prices right also generates significant public revenues. These revenues can be used to finance sustainable infrastructure in various ways. 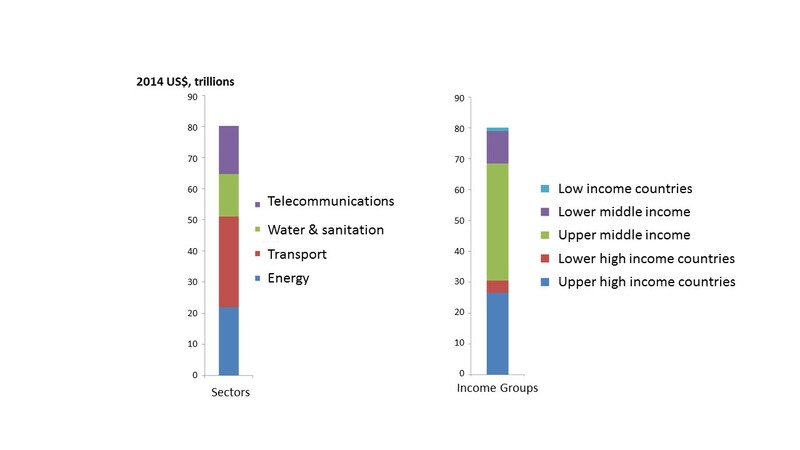 First, in most countries, revenues from national carbon pricing schemes, in line with limiting global temperature increase to well below 2°C, would be sufficient to provide universal access to key infrastructure services and thus help to achieve Sustainable Development Goals, see Figure 4. Second, carbon pricing may be a lever to increase the economic efficiency of the tax system, especially in economies with large informal sectors, as evading taxes on fossil fuels is less likely than evading sales or income taxes. By substituting income or value added taxes with green fiscal reforms, adverse effects on the poorest members of society can be avoided. Third, carbon pricing revenues can also provide funds for green industrial policies, e.g. to pay emerging firms with climate change solutions for GHG reductions as a bridge to a meaningful price on carbon. Finally, revenues from carbon pricing could serve as a means to ramp up domestic resource mobilization, being one of the main goals stated in the Addis Ababa Action Agenda. Climate finance can play an important role in supporting such national carbon pricing efforts. Figure 4: Share of carbon revenues needed to provide universal access to water (measured by the ratio of costs of closing the infrastructure gap over carbon revenues): a ratio exceeding 1 (white) implies that carbon revenues are not sufficient to cover the cost of closing the gap. 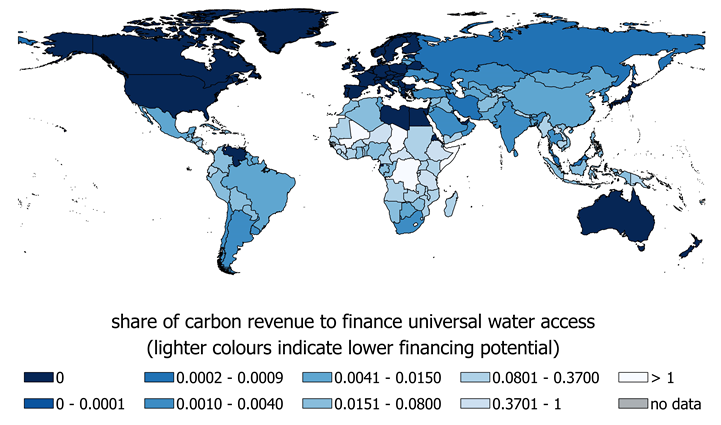 The darker the colour shading, the lower the share of carbon revenues needed to finance universal access. The darkest shade includes countries that are already close to or have universal access. Source: Jakob et al. (2016). Policy makers must be equipped with the same quality of information on the low carbon economy as is available for today’s economy. Implementing monitoring systems to track steps towards a low carbon economy will ensure the same quality of economic information that already exists for incumbent fossil-fuel sectors. G20 members must implement long-term low GHG emission and climate-resilient development strategies, in accordance with Article 4 of the Paris Agreement, supplemented by reliable metrics to track progress (see T20 policy brief on establishing an Expert Advisory Commission). To determine whether developments are in line with stated targets, they should be made subject to regular rounds of peer-review, as is already common practice in numerous international fora. Assess the adequacy of carbon prices: The G20 Finance Ministers should commit to a peer review process to assess the adequacy of the current carbon pricing systems to deliver the Nationally Determined Contributions under the Paris Agreement. Phase out fossil fuels subsidies: The G20 have pledged, every year since 2009, to phase out fossil fuel subsidies, but have not set a specific deadline to do so. We suggest that the G20 members should now set 2022 as a target date for eliminating fossil fuel subsidies, including both production and consumption subsidies. This should be accompanied by redirecting the savings towards groups most affected by the reform. In addition, all G20 members should complete their fossil fuel subsidy peer reviews by 2018. Develop a carbon pricing roadmap: A permanent platform for cooperation on carbon pricing within the G20 should be established with the aim of (i) developing a roadmap to implement carbon pricing to double the level of emissions covered by carbon pricing mechanisms from current levels of about 17 percent within the G20 to 35 percent by 2020, and doubling it again within the following decade, (ii) agree on a minimum carbon price that should grow over time to become transformative, (iii) underpin bilateral endeavour and mutual peer-review of carbon pricing systems, and (iv) price carbon broadly, while maintaining social equity and increasing access to sustainable infrastructure, to ensure a just transition towards a low-carbon economy. This policy brief is a joint product by all members of the Task Force Climate Policy and Finance (see ) and draws on joint discussions at the workshops on 3.12.2016 and 28.02.2017. It is lead-authored by the Co-Chairs Céline Bak, Amar Bhattacharya and Ottmar Edenhofer and by the coordinator of the Task Force Brigitte Knopf. It benefited considerably from input by Jan Steckel, Michael Jakob, Olivier Bois von Kursk, and Gregor Schwerhoff, from MCC. Delivering on Sustainable Infrastructure for Better Development and Better Climate. Our analysis is based on peer-reviewed literature, as given in the references. The recommendations are based on the evidence of this literature, but are personal opinions of the authors. Green Finance can be understood as the financing of investments that provide environmental benefits in the broader context of environmentally sustainable development (G20 Green Finance Study Group). 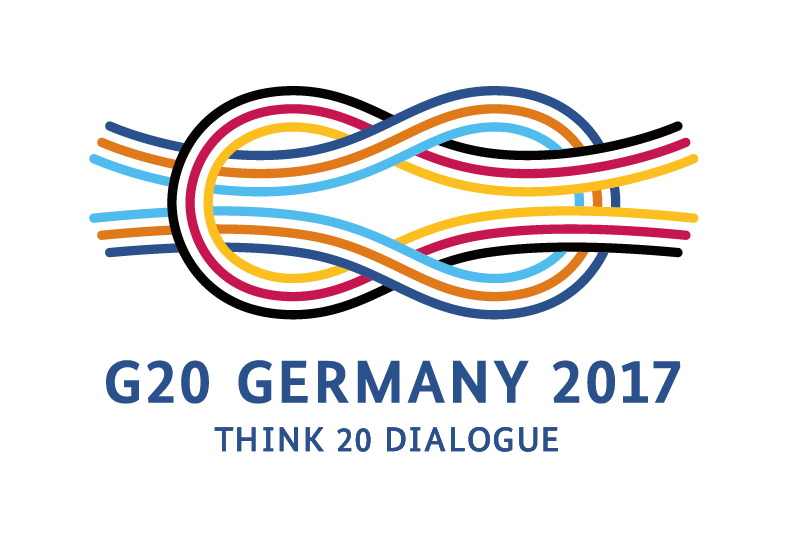 It was brought forward in the G20 context during the Chinese presidency in 2016. How Large are Global Energy Subsidies? IMF working paper. Steckel, JC., Edenhofer O., Jakob M. (2015): Drivers for the renaissance of coal. PNAS 112(29):E3775–E3781. Fossil Fuel Subsidy Reform: From Rhetoric to Reality, New Climate Economy, Working Paper. Carbon pricing pathways. Navigating the path to 2°C. Franks, M., Edenhofer, O., Lessmann, K (2015): Why Finance Ministers Favor Carbon Taxes, Even if They Do Not Take Climate Change into Account, Environmental and Resource Economics. Löschel, A., Großkurth, P., Colombier, M., Criqui., Dexion, S., Furuhata, K., Gethmann, CF., et al. (2017): Establishing an Expert Advisory Commission to assist the G20’s Energy Transformation Processes. T20 Task Force on Climate Policy and Finance. (iii)	Phasing out fossil fuel subsidies and putting a price on carbon to harness the transformative power of the market and stimulate low carbon investment. The Paris Agreement builds upon the Convention and – for the first time – brings all nations into a common cause to undertake ambitious efforts to combat climate change and adapt to its effects, with enhanced support to assist developing countries to do so. As such, it charts a new course in the global climate effort. The Addis Ababa Action Agenda, provides a foundation for implementing the global sustainable development agenda that world leaders are expected to adopt this September, and consist of a series of bold measures to overhaul global finance practices and generate investments for tackling a range of economic, social and environmental challenges. The agreement was reached by the 193 UN Member States attending the Conference. At the end of a G20 summit, the heads of state and government of the G20 issue a joint statement with the main results of the meeting. Joint report by the International Energy Agency (IEA) and the International Renewable Energy Agency (IRENA) on request by the German G20 presidency. It investigates the essential elements of an energy sector transition that would be consistent with limiting the rise in global temperature to well below two degrees Celisius (2°C), as set out in the Paris Agreement.